BELGAUM: A new row over the name Sanyukta Maharashtra chowk has arisen thanks to the forthcoming assembly session in town. 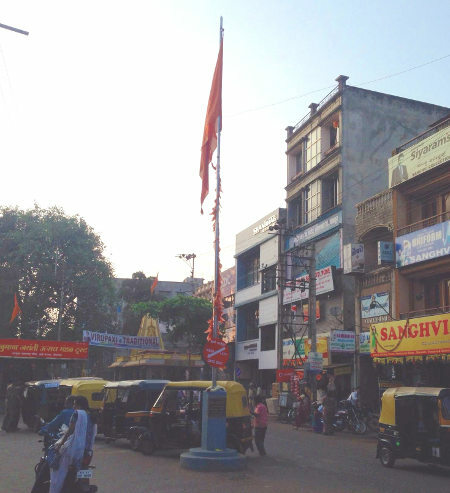 It has been learned from sources that a few Kannada organizations had asked the authorities that the name post be removed which also holds the saffron flag. The Kannada organisation want it to be renamed as Jawaharlal Nehru Chowk and they said this is the original name of the intersection. The circle at the Nana Shankar Seth Marg – Ramdev Galli- Samadevi Galli Corner is known as Sanyukta Maharashtra chowk. It was named so officially when Belgaum was a Municipality in 1957. A resolution to that extent was also passed and same was recorded in the gazette as well . The current row over this seems to be because the flag poleward was recently renovated during Ganesh festival by the Ganesh mandal and 9/9/2013 is the date mentioned on it. If one goes to see this date has no importance as it is date of renovation. Today there was a protest by Marathi speaking groups and the protest was called off after the Dy SP assured complete security to the flag pole and name post. Two policemen were sighted standing by the side of road. Previous articleBelgaum sets off for LEAD Prayana – a LEADERSHIP Journey on Wheels! Rename as SAMYUKTA KARNATAKA CIRCLE.